Emerging and Readily Available Technologies and National Security is a study on the ethical, legal, and societal issues relating to the research on, development of, and use of rapidly changing technologies with low barriers of entry that have potential military application, such as information technologies, synthetic biology, and nanotechnology. The report also considers the ethical issues associated with robotics and autonomous systems, prosthetics and human enhancement, and cyber weapons. These technologies are characterized by readily available knowledge access, technological advancements that can take place in months instead of years, the blurring of lines between basic research and applied research, and a high uncertainty about how the future trajectories of these technologies will evolve and what applications will be possible. I think it's funny that the original DARPA charter for the study used the term "democratized" (what an ugly word) rather than "emerging and readily available" to refer to the technologies. Democratized is a a popular buzzword found in marketing copy about computer aided engineering solutions. It seems to illicit similar disdain in that setting as well. The report raises lots of questions. I was glad to notice that they acknowledge that addressing compatibility of weapons technologies with the Law of Armed Conflict has a long tradition in the US Department of Defense. Managing the application of force ethically is not new even if the tools used to apply force are changing. I'm not sure that the issues raised are novel. For example, "What limits, if any, should be placed on the development of cyber weapons, given the nature and extent of the economic damage that they can cause?" This is already well addressed by the concepts of Proportionality and Distinction. National Research Council and National Academy of Engineering. 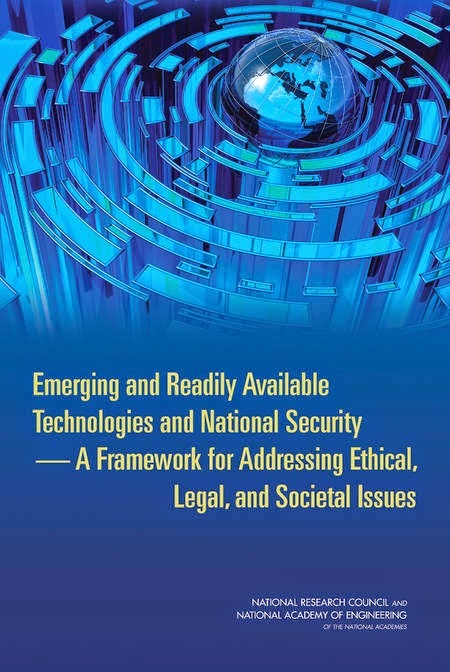 Emerging and Readily Available Technologies and National Security A Framework for Addressing Ethical, Legal, and Societal Issues. Washington, DC: The National Academies Press, 2014.